It was my birthday at the weekend and as a special treat my husband took me to the seaside (look, what can I say, I may be getting on a bit, but inside I’m still five years old!). Where we live it’s always a bit of a trek to get to the beach. The journey takes a good couple of hours mostly across the windy, up and downy, country roads that transverse the spectacular North Yorkshire Moors, so we don’t do it very often. 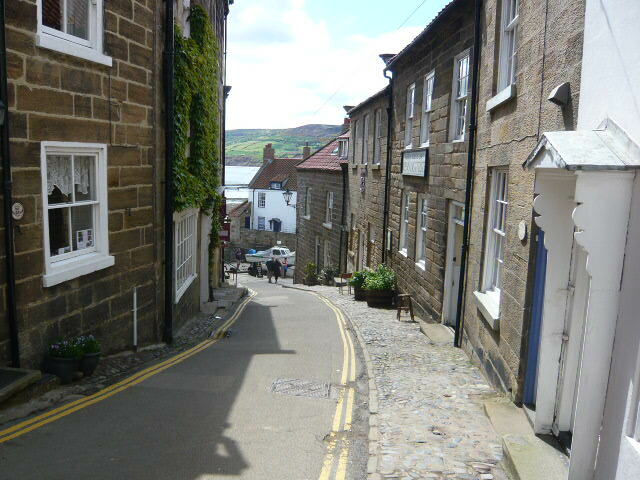 In fact we’d never been to Robin Hood’s Bay before, but as you can see from the pictures it is really rather pretty (and quintessentially English), and we had a perfect day there eating ice creams, paddling in the icy sea, eating fish and chips,walking along the cliff, eating cake, lying about a bit more…..you can tell there was a bit of a theme going on! Anyhoo… back to ‘on the way’. You can’t really drive down to the beach, as the roads are so narrow, so I took this snap of our first glimpse of the sea as we walked down the very steep hill (it seemed even steeper on the way up, especially after all that food!!). Although they don’t really fit the remit, I thought you might like to see a couple of other photos we took while we were messing about at the seaside! I’m afraid I didn’t have my ‘proper’ camera with me, so the quality is slightly iffyer than usual! This entry was posted in England, Photo Challenges and tagged England, on the way, photo, Photo Challenge, photography, Robin Hood's Bay, Seaside. Bookmark the permalink. Yes, it was very quaint, but heaving with people! Goodness knows how crowded it will be in mid-summer!